Okay, not all surprises are nice. Being surprised by an axe-wielding lunatic on your way home from the pub isn't nice. But lots of surprises are nice. 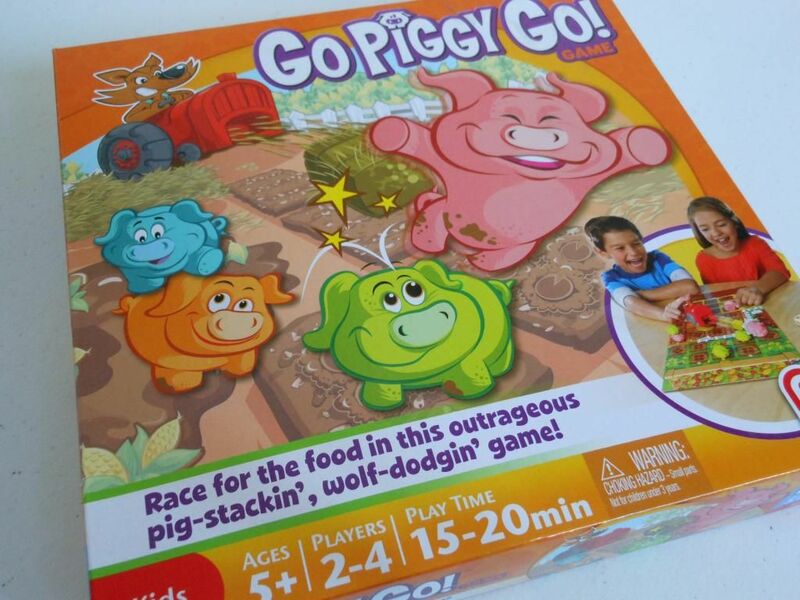 For example, last year, when I asked my daughter what she wanted for her birthday, she said "Go Piggy Go!" I had no idea what she was talking about until I looked it up on the Internet. Turns out it is a family board game that she had seen advertised on the television. I had been playing board games with my daughter for a little while (Parcheesi, Dominoes, Memory Games, Snakes and Ladders), but it still came as quite a surprise that she was asking for games for her birthday, especially games I had not even heard of. 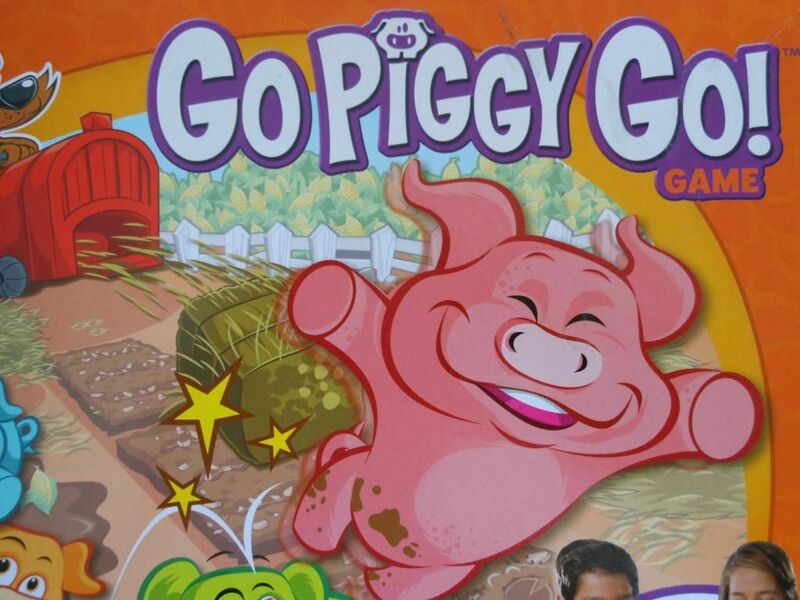 But the biggest surprise of all is that Go Piggy Go! is actually good. This is not something that is immediately apparent. It isn't like opening the fridge and finding an elephant. It is more like opening the fridge and finding elephant-shaped paw prints in the butter. You see, when you set up the game, it looks like every other roll and move game ever. 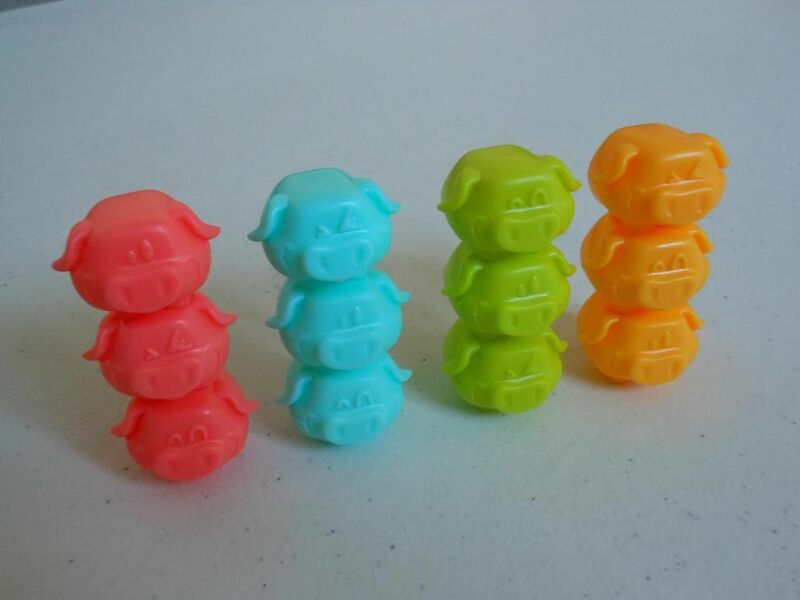 The aim of the game is simple: Each player has three cute plastic pigs that need to be moved from a starting space at one end of the board, to a food trough at the other. So, on a player's turn, he or she rolls the dice, and moves one pig that number of spaces. The path is very linear, and there really is no decision making at this point. Just move as much as possible. But there is a cool little twist. In the middle of the board there is a plastic wolf riding a tractor. When you press the wolf, plastic hay bales shoot out of the front of the tractor. 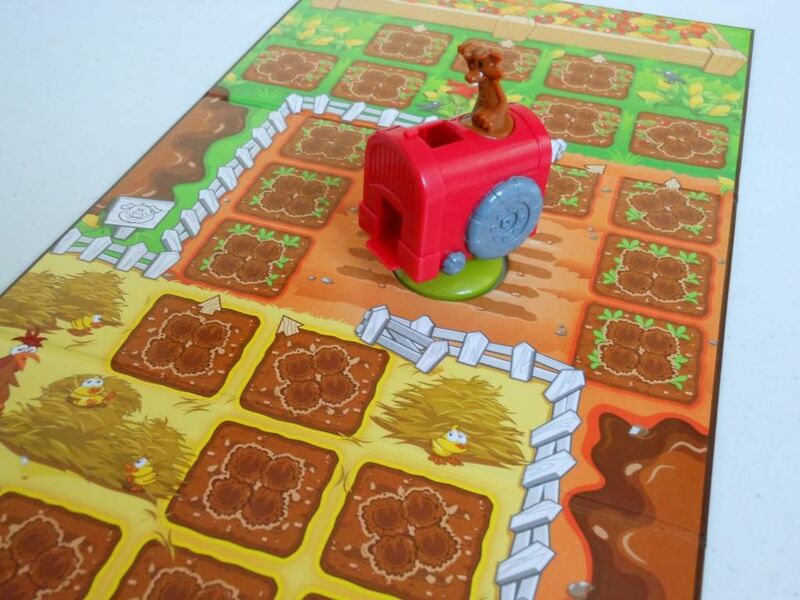 If a player rolls the side of the dice that has a number and a wolf symbol, he or she gets to choose what to do: move a pig, or fire the tractor. Of course, children always want to fire the tractor. The purpose of firing the tractor is to hit the pigs. Any pig hit is sent back to the start (or one of two pre-set checkpoints). This is not a major element of the game. Sometimes the wolf only gets fired once or twice, and often there is not much point in doing so; but it does add a nice little dexterity sub-game, and usually raises a few laughs when "Daddy's pig" gets sent back to the start. Again. And again. However, what really raises this game above some of its peers, and makes it something that is actually a bit interesting to play, is the way in which the pigs interact. When a pig moves, it can enter a space with another pig. It can do this to "jump" the pig and then carry on; however, it is also possible to enter the space with another pig and then stop there. When this happens, you stand your pig on top of the pig that was already there. From that point on, if the pig on the bottom moves, the big on the top moves with it. You can hop your pigs onto other pigs, and then get a free ride from one end of the board to the other. And of course, if the pig on the top ever wants to move, he can do so without moving the big on the bottom. And the final wrinkle in the rules is that no more than two pigs can occupy a space. That means it is possible to block routes across the board. In practice, you see a lot of pigs hopping on other pigs, creating roadblocks the other players cannot circumvent. Of course, those road blocks then become the prime target for the hay-firing wolf. It all becomes surprisingly tactical. Okay, it's not Chess, but there is a lot more going on here than meets the eye. More than enough for adults to actually enjoy the game rather than merely tolerating it for the sake of the children. I also rather enjoyed the little in-jokes and puns: The pigs take piggyback rides on each other, each player controls three little pigs, and rather than blowing down houses made of straw, the wolf uses hay bales to knock down pigs. So, surprisingly, I would recommend this game to anyone with young children. It is fun, fast, colourful, and just tactical enough to keep older players interested. It won't win any awards, but it is better than it really has any right to be. And the pigs are cute.